You can't do anything without wood. Here's what to get. The raw materials for most furniture making projects fall into three general categories: softwood lumber, hardwood lumber and manufactured panels. The type of material you use for any given project depends on various factors: strength, hardness, grain characteristics, cost, stability, weight, color, durability and availability. 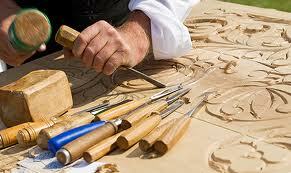 Most beginning woodworkers have their first experience with softwood, usually pine lumber. It's soft and easy to work, and you don't need expensive shop equipment to get good results. It's also readily available at local lumberyards and home centers. But it does have some notable liabilities, especially if you're planning to make a fine piece of furniture. So before you buy a bunch of pine for that coffee table you have in mind, investigate all your options. Softwood is the wood from an evergreen or coniferous (conebearing) tree. Examples are the many varieties of pine, fir, spruce, hemlock, cedar and redwood. Some softwoods are used as veneer in plywood panels. But most of us are more familiar with this material in solid lumber form. Most of the wood at lumberyards and home centers falls into the softwood category. These woods are the mainstay of the home construction industry. They're used for framing lumber, window sash material, millwork stock and much more. Generally speaking, framing lumber, such as fir, spruce and hemlock, is not used for fine furniture making. But pine boards do play a significant role in cabinetmaking and architectural trimwork. Pine boards are sold in nominal widths from 2 in. to 12 in. The actual measurements of these boards are usually 1/2 in. to 3/4 in. less than their nominal dimensions. A similar convention applies to a board's thickness. A nominal 1-in. board is actually 3/4 in. thick and a 5/4 board is actually 11/16 in. thick. All softwoods are sold in even foot lengths from 8 ft. to 16 ft.
One of the advantages of using pine for a project is that you can confidently anticipate the sizes of lumber that are available and easily calculate the yield you can get from the stock. This can be much more difficult when you work with hardwoods–more on this later. Unfortunately, pine and most other softwoods are less stable than most hardwoods. They absorb and lose moisture more readily and are normally sold with a higher moisture content–up to 15%–than hardwoods, which usually have ranges from 6% to 8%. If you plan to use pine, purchase the lumber at least two weeks before starting your project and keep it indoors. Be sure to place stickers (small pieces of scrap wood) between the boards to permit good air circulation around each piece of stock. These procedures will allow the wood to reach an equilibrium with the indoor environment before you begin, which reduces the likelihood of dramatic wood movement after a project is complete. While several grades of pine boards are routinely milled, in practice you'll find only two grades at most suppliers: select and No. 2 common. The common grade allows tight, solid knots in the face of the board and is most often used for paneling, shelving and paint-grade work. For furniture applications the select grade is the better choice. This stock is free from most knots, though tight pin knots and small resin pockets are allowed. Pine is best used for designs where an informal or rustic appearance is preferred. The characteristic softness of the material, as well as its broad grain pattern, are well suited to furniture in Early American country styles. Clear, oil-based finishes give pine an attractive warm amber cast. But applying stain, particularly oil-based ones, can present problems. Pine is extremely resinous and has a grain that can change dramatically from one area to the next on a given board. Consequently, the wood is likely to absorb stain in an uneven manner, creating a blotchy appearance. You can achieve a more uniform stained surface by applying a wood conditioner to the piece first. The conditioner limits the absorption of the stain. But keep in mind that using a conditioner isn't always successful. So, it's a good idea to run a test first on an inconspicuous part of your project to make sure you're happy with the results. Of course, pine is a perfectly good choice when a paint-grade surface is desired. The most striking characteristic of pine, however, is its softness. You can often leave an impression by simply running a fingernail down the board. Hardwood lumber comes from deciduous trees, the ones that shed their leaves annually. Some popular domestic species are oak, maple, cherry, birch, walnut, ash and poplar. Of these common native hardwoods, only red oak and poplar are usually stocked in home centers and lumberyards, where they're frequently sold in the same sizes as pine boards. But most hardwoods are carried by specialty suppliers and are sized according to a different convention. The thickness of hardwood lumber is specified in quarters of an inch, measured when the wood is in a rough, unplaned state. The thinnest stock is 4/4, representing 1 in., and the thickest usually available is 16/4, representing 4 in. Most suppliers will plane and straighten the edges of their stock before selling it. Expect to pay more for this, but without a fully outfitted workshop at home, you have no sensible alternative. Of course, the finished thickness is different from the rough thickness. For example, 4/4 stock ends up being 13/16 in. thick. Instead of being milled to specified dimensions, like pine, hardwoods are sold in random widths and lengths. Normally, the narrowest boards are 4 in. wide and the shortest lengths are 6 ft. long. Depending on the species, boards can range up to 12 in. or 14 in. wide and 16 ft. long. This variety in sizing means that you must calculate the yield of a given board in the context of your specific project. To help you do this, take advantage of your lumber dealer's expertise. Talk to him or her about the nature of your project and be prepared with a list of the cuttings you need. While the popular notion has always been that pine lumber is less expensive than hardwoods, that isn't the case anymore. These days you can purchase some hardwoods, like poplar and soft maple, for the same price as pine. Hardwoods like walnut and cherry, however, are much more expensive. The cherry we used for our console table project cost nearly $5 a board foot, compared to $3 a board foot for pine. Not only are hardwoods sized differently from softwoods, but they're also priced differently. Most suppliers sell pine boards at a price per lineal foot, based on the width of the board. Hardwoods are sold by the board foot, which is defined as a square foot of rough lumber that is 1 in. thick. When a board is thicker than 1 in., the dealer multiplies the square footage by the thickness to arrive at the sale price. An 8/4 board will therefore cost twice as much as a 4/4 board of the same size. Working with hardwoods is quite different from working with pine. With the exception of poplar and basswood, which tend to be rather soft, you cannot drive a nail through hardwood lumber without first boring a pilot hole. And cutting and planing hardwoods requires extremely sharp tools. But the resulting edges are clean and crisp. Because of this, when a project calls for fine detail work, a hardwood is the best choice. Some hardwoods, such as oak and ash, are known as open-grain woods. These species have alternating areas of relatively porous and dense wood. The grain patterns in these boards tend to be quite striking. When stained, the open-grain areas absorb the color readily while the harder areas are more resistant. This contrast accentuates the grain patterns, creating a dramatic effect. Cherry, maple and birch are closed-grain woods. These woods demonstrate a more uniform texture throughout a board. They are excellent choices for projects with a formal or reserved appearance. Poplar is also a closed-grain wood, but its color ranges from a creamy beige to olive green, and frequently has purple highlights thrown into the mix. Because of this unusual coloration, poplar is rarely used if a furniture piece is going to have a clear finish. This wood is best when stained or even painted. Hardwoods are also commonly used as outer veneers on manufactured panels. These veneers are extremely thin sheets of wood that are glued to a panel core of solid wood strips (lumber core), alternating veneer layers (veneer core) or particleboard. Such panels are usually fabricated in 4 x 8-ft. sheets, but they are available in other sizes. Their thicknesses range from 1/4 in. to 1 in., and they are often used in furniture and cabinet construction, and architectural trimwork. There are many advantages to using manufactured panels. Because of their laminated construction, they are extremely stable in all dimensions. And using them yields considerable labor and cost savings, especially when large, flat surfaces are required. Since the veneers on any given panel are usually cut sequentially from the same log, the panel should display a uniform color and grain. Matching the grain pattern of solid wood to the generally uniform grain pattern on the panels can be difficult. But careful planning can yield good matches in the most visible areas of your project. Because solid hardwoods, like the softwoods mentioned earlier, will move with changes in humidity, this must be taken into account in projects that combine solid wood with manufactured panels. Many joinery techniques have been developed to accommodate this movement. The use of solid wood frames surrounding veneered panels in door construction is just one example. Manufactured panels do have a couple of limitations. First, whenever a panel is used, regardless of the core, the edge must be hidden. In most cases, this is achieved by gluing a strip of solid wood to the panel edge. This process is called edge-banding. And second, the veneers on the panel surface are extremely thin, often less than 1/32 in. Because of this, the surface is fragile and has a tendency to split out, especially on the back side of a saw cut. Also, since the veneer is so thin, there is little margin for error when sanding the surface. Aggressive sanding can quickly work through the veneer and expose the unattractive panel core underneath. There's no doubt that many successful furniture pieces have been constructed of softwood lumber. And manufactured panels play an important role in many high-end, extremely expensive pieces. But for the beginner, the best choice is still solid hardwood stock. It may be more difficult to work with than softwood, and in some cases it doesn't have the dimensional stability of panels. But when you're done, you'll have something that will last a lifetime and look ood every time you glance its way. This is a very informative post - thanks for sharing! This is one of the things I wish I knew before starting with DIY woodworking but I had to learn of it the hard way. Good thing you have shared this with us so everybody can learn!